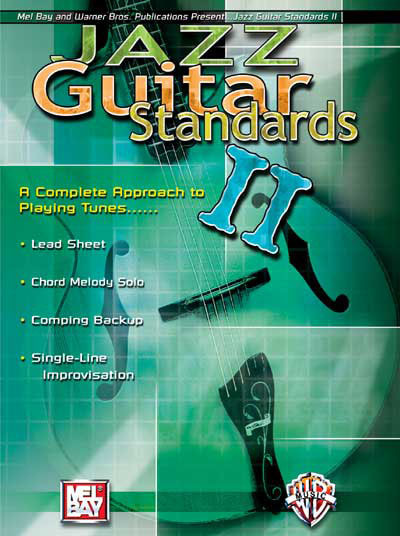 This second volume of Jazz Guitar Standards contains a collection of 22 Jazz standards each containing a chord melody, a comping etude and a single-note solo. All arrangements are presented in standard notation and tablature for the beginning to intermediate guitarist. Tunes include: “All of You”, “April in Paris”, “As Time Goes By”, “Bluesette”, “But Not For Me”, “Can’t Help Lovin’ Dat Man”, “East of the Sun (and West of the Moon)”, “Embraceable You”, “In Your Own Sweet Way”, “It Don’t Mean a Thing (If It Ain’t Got That Swing)”, “I’ve Got You Under My Skin”, “Long Ago (and Far Away)”, “Misty”, “My Funny Valentine”, “Night and Day”, “Smoke Gets in Your Eyes”, “Someone to Watch Over Me”, “Speak Low”, “Summertime”, “The Way You Look Tonight”, “What Is This Thing Called Love?” and “You Go To My Head”. Arrangements by Chris Buzzelli, Dave Frackenpohl, Barry Greene, Sid Jacobs, LaRue Nickelson, John C. Purse, Bruce Saunders, Rick Stone, Ron Berman and Jack Wilkins.